Shockingly racist advertisements paid for by a notorious Islamophobic group led by famous anti-Muslim inciter Pamela Geller are currently being displayed on several MUNI buses in San Francisco, after New York City’s transportation agency said they wouldn’t consider running the ads. This photo of the racist ad has been passed around by activist groups and the local media in the Bay Area. Sponsored by the American Freedom Defense Initative (AFDI), which has been defined as a hate group, the ads have drawn outrage from civil rights, human rights and legal advocates and activists in the San Francisco Bay Area, as well as citizens who have called San Francisco’s transportation authority and signed a petition demanding to take the ads down. Last month, a federal judge ruled that New York’s MTA had violated the AFDI’s First Amendment rights by rejecting the group’s ads for city bus placement. That decision prompted the Muni in San Francisco to accept the ads, despite the fact that it has a policy against political advertising. Because what’s political about a Jewish organization putting out a bus ad that tacitly calls Palestinians subhuman savages? Following the outrage about these inciteful advertisements — which were put up during a time when Arabs, Muslims and other persons of South Asian and Middle Eastern descent are being targeted, their places of worship attacked, shot, killed, and pursued by white supremacist groups, members of Congress, and government agencies in this country — several Bay Area-based civil rights groups sent out a press release earlier today saying they will begin to measure the impact of the ads on the Arab and Muslim community. For their part, the San Francisco municipal transportation agency agreed that the ads “have no value in facilitating constructive dialogue or advancing the cause of peace and justice,” and stated that the advertising revenue would be directed to the SF Human Rights Commission. SAN FRANCISCO, CA - Today, American Muslims for Palestine (AMP), the Asian Law Caucus (ALC), the San Francisco Bay Area office of the Council on American-Islamic Relations (CAIR-SFBA) and Jewish Voice for Peace (JVP) cautiously welcomed a response issued by the San Francisco Municipal Transportation Agency (SFMTA) in response to anti-Palestinian and Islamophobic advertisements running on San Francisco buses. The groups have been working on a community assessment and response to the ads since complaints of them were first received last week. The ad, sponsored by a group calling itself The American Freedom Defense Initiative (AFDI), led by Pamela Geller, states: “In Any War Between the Civilized Man and the Savage, Support the Civilized Man.” It further states, “Support Israel, Defeat Jihad.” AFDI has been identified as a hate group by the Southern Poverty Law Center. “While the community respects the importance of free expression even for offensive speech, it is clear that these ads were designed specifically to intimidate Muslim, Arab and Palestinian members of the San Francisco community,” said CAIR-SFBA Executive Director Zahra Billoo. In the statement issued yesterday, the Chairman of the SFMTA Board of Directors and SFMTA Director of Transportation on Advertisement acknowledged that although the First Amendment prevented them from removing the advertisements from public buses, they have “no value in facilitating constructive dialogue or advancing the cause of peace and justice.” Further, the statement went on to commit to directing all resulting advertising revenue to the SF Human Rights Commission (HRC). ALC, AMP, CAIR-SFBA and JVP will be concluding a week-long community assessment this Friday, and plan to work with the HRC to develop requests of SFMTA that will properly reflect the level of community concern as well as solutions for remedying the harmful impact of these advertisements. For more information, see Who’s Behind the anti-Muslim Ads on MTA and MUNI? 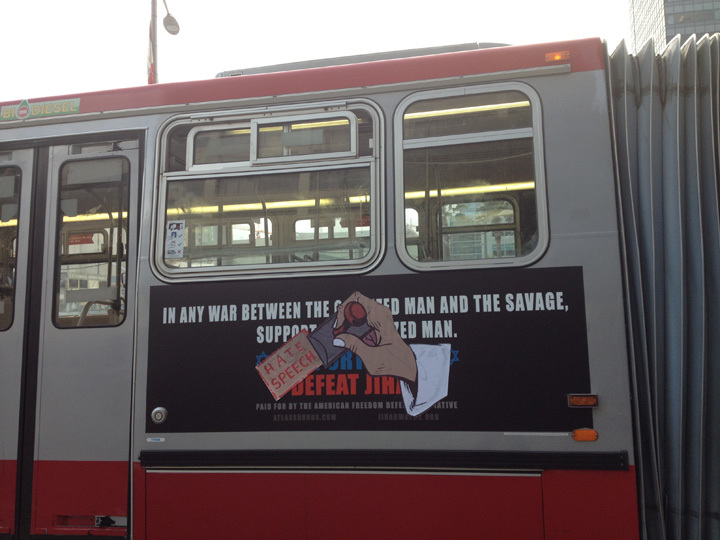 in Mother Jones, and KQED’s blog post on the issue, MUNI Bus Ads Calling Israel’s Enemies ‘Savages’. If they can now run political ads, why can't we? Using the same mechanism (threat to sue) lets raise money and run ads in the San Fran and New York public transportation system. From the same viewpoint, someone could advertise using any four letter word. I am saddened though not surprised that people read the constitution that way. The first amendment is there to protect free citizens, not so that dumb people can openly verbly bully another. The way to handle this is simple. Anytime some racist group wants to promote this way, all a company has to do is put a disclaimer above it- "It has been interpreted that the first amendment gives some people the right to advertise racist written attacks. We submit that the following is such and definitely do not endorse the following racist comments. by law, we are forced to accept this groups money and appologize in advance. You may reach (person or group) who is responsible for this ad at...( number and address)". As long as the disclaimer is in the advertising contract and at the discretion of the company being payed it would be legal. "New York City’s transportation agency said they wouldn’t consider running the ads." Perhaps it's because "the American Freedom Defense Initative (AFDI) ... has been defined as a hate group ..."
But you don't say who proclaimed this definition. How official is this status? Is your reference the press statement saying the Southern Poverty Law Center "identified" (not defined) AFDI as a hate group? Capt. Humayun Saqib Muazzam Khan Buried at the Arlington National Cemetery, ... Khan was posthumously awarded a Bronze Star and a Purple Heart. Army Special Forces Staff Sgt. Ayman Taha of Virginia, who was killed in Iraq in 2006 and of Army Cpl. Kareem Khan of New Jersey, who was killed there in 2007. Both received the Bronze Star.